Margaret K. McElderry died at the age of 98 this week. Legendary is a word that comes up a lot when her name is mentioned; she edited many children's books that became winners of Caldecott and Newbury medals (one memorable year her books won both awards), and she created her own imprint, Margaret K. McEderry Books, now at Simon & Schuster. But she did not, as this morning's New York Times obituary said, "exactly glide to success." She was told as a senior at Mount Holyoke that she had nothing to offer the publishing industry, and in 1971 she was told by her boss at Harcourt: "The wave of the future has passed you by." After being told this she went on to work and win awards for over thirty more years in publishing. Margaret published and edited four of my children's books and was not only a brilliant editor and made each book far better than I ever dreamed it could be, but she was also an amazing friend to her writers. I loved working with her and loved our lunches together in New York. Once in LA when she was visiting I got seriously lost and in an absolute panic driving her around Beverly Hills trying to find our restaurant (OMG I've got Margaret McElderry in the car and I'm lost). We ended up laughing about it every time we got together. She might have been a legend in publishing but she was also warm and funny and kind, and so much fun to be with. Remembering Margaret working with such energy and enthusiasm into her nineties will inspire me for the rest of my life. The most important thing I have to tell anybody who wants to write for kids is this: write a story from your own feelings. The big emotions of childhood – happiness, anger, jealousy, embarrassment etc. – don’t change that much when you’re a grownup. The only thing that’s different is your frame of reference and hopefully some control over your wilder emotions. Beware of writing a message for kids. They can smell this-is-something-you-need-to-learn a mile away. Yes, there can be subtext, an understanding of what they feel and maybe a nudge in a positive direction, but no lessons in neon. First and foremost kids need a story to entertain them. They want to laugh, they want to read about behavior as crazy as their own, and emotions as deep and wide as the ones they feel. 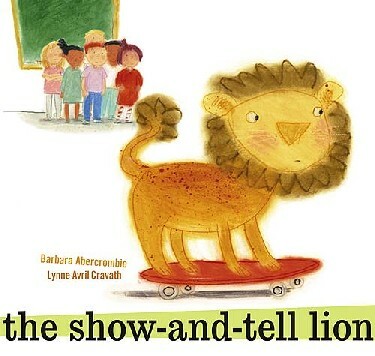 Next Tuesday is the official publication date of The Show-And-Tell-Lion, my new children’s book (the wonderful illustrations are by Lynne Avril Cravath). I wrote about my advance author copies arriving a few months ago on this site (how weird it was to see this craziness become an actual book, respectable with it’s own ISBN number) but next week is the first time the book is on sale. The idea for this story came from my most embarrassing childhood memory – a lie I told at show-and-tell in the first grade. In my book Matthew announces in show-and-tell that he has a pet lion at home. My lie was that I had a grown up brother and sister who were movie stars in Hollywood. I was six years old and to this day I remember how absolutely awful it was when my lie spread all over the school and I had to keep making up more lies. The energy in the story comes from that awful embarrassment I felt and can still remember in the pit of my stomach. To Do: Make a list of all the emotions you remember from childhood. One by one, see if you can remember the details – what caused the emotion, what did you do about it, how did your body feel. Whether you want to write for kids or not, this can be a helpful exercise for writing memoir, or for your characters in fiction. To Do: Write about a lie you told. Why you told it, how you felt, what happened because of it.